Though I love Regina King’s performance as Detective Lydia Adams, Tang and Cooper have taken over as the best element of Southland’s fourth season. They gel as partners and understand each other on an innate level that allows them to do good work. They’re dedicated in the same way, which isn’t to say that Ben wasn’t dedicated to his job as well, just not in the street-hardened, earned fashion that Tang and Cooper recognize in each other. It helps that Michael Cudlitz acts the hell out of his part and Lucy Liu has more than matched him in every scene so far this season. “Legacy” is the second straight midpoint episode to focus on John Cooper, and though it doesn’t have the strong surrounding plots to make this a truly great episode, at least this time Cooper isn’t stranded away from everyone else, alone in the desert. In the morning, Cooper gets a pin during roll call commending him for 20 years of service — though, in a great bit of detail, Cooper has actually served 22 years and the honor got delayed presumably due to a lethargic LAPD bureaucratic system. This is cause for reflection, and the first call he and Tang respond to for the day immediately brings out personal connections. At a domestic disturbance call, a kid and his parents are yelling at each other. The parents don’t want their kid to go to school, and somebody mentions naked pictures sent to another boy. This is about the strangest way for Tang and Cooper to find out that the kid, Michael, is gay, but in the heat of an argument that leads neighbors to call the police, it reinforces Southland’s verite style to approach the scene in this way. Cooper’s personal interest in attempting to impart advice isn’t just obvious; it’s the kind of action that defines his character. This time, Cooper takes the kid aside, tries to talk to him, give him some basic words of wisdom, but the kid isn’t having any of it, and storms off, leaving Tang and Cooper unable to do anything. Stay with me on this one, but my favorite sports show to watch right now is Dan LeBatard Is Highly Questionable on ESPN2. (I don’t watch it, I listen to the podcast since it’s on during the day, but that’s beside the point.) LeBatard might be an insanely annoying sports personality to many, but he conducts more insightful and unexpectedly brilliant interviews than 99 percent of the mainstream sports media on television right now — take his amazing Pat Sajak interview that blew up all over the place as a prime example. I bring this up because two weeks ago he interviewed Kenny Smith, former Houston Rocket, analyst on TNT’s Inside the NBA, and father of an aspiring teen pop star. A little more than halfway through the interview, LeBatard asks Smith about “the greatest difficulty in being a father to teenagers,” and Smith barely hesitates before answering that it’s that teenagers simply don’t believe that you’ve done what they’ve done, you’ve gone through what they’re going through. Though Smith is referring to much lower stakes situations, that’s exactly the concept Cooper struggles to impress upon Michael, first with no immediate consequences, then with dire consequences on top of a downtown high-rise, where Michael prepares to jump to his death after kids at his school beat him up, put him in a dress, and tied ribbons in his hair. Talking Michael down from the roof has the kind of immediate tension that resides on the opposite side of the coin from Cooper’s incredibly articulate and well-prepared speech at his father’s parole hearing in last season’s fifth episode “The Winds.” He’s frantic but under control, changing gears as fast as he needs to in order to keep Michael talking to him as he inches closer along the roof. Even though it seems like Cooper gets through to the kid — he says “thank you” after all — Michael still attempts to jump. When Cooper catches Michael by the ankle, there can be no remaining doubt about the strength of his back. Tang and the other officers help him pull Michael back onto the building to safety, and there’s no mention of pain or anything wrong with Cooper at all. Still, it’s clear that the kid intends to commit suicide, even in the face of the most helpful advice possible. Cooper never brings up his sexuality unless absolutely necessary. He was in a gay bar in the pilot of the series, and there have been brief scenes of him in bed with someone, as well as a memorable funeral that Ben accompanies him to, but this was the first verbal confirmation of his sexuality outside of a private situation, with other police officers within earshot. Not a milestone, per se, but another demonstration of Cooper striving for a very moral life, unafraid to talk about who is he. His final line of advice to Michael in the hospital sums up Cooper’s character perfectly: “I’ve got a lot of problems kid; being gay isn’t one of them.” I’ll take that over “It gets better” any day. When Tang gets a call on her cell phone later, during a traffic stop where Cooper unleashes his wrath on a whiny, privileged prick, it’s clear that Michael is already dead. When Tang tells Cooper in the alley behind the bar as he’s leaving the tribute party, he already knows, and he seems unaffected. He does everything in his power to help those in need — when he’s on the clock. 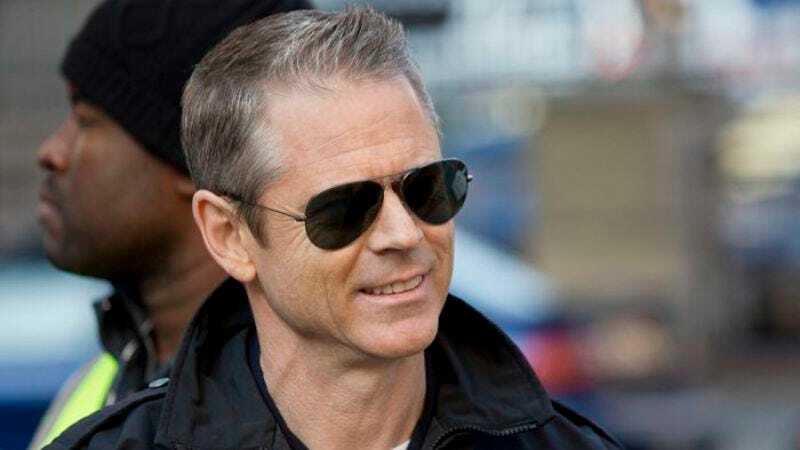 What makes Cooper such a great police officer isn’t just his ability to get things done the right way while on his shift; it’s that he knows when to let a case go. After Sammy and Ben spent the past few weeks mired in angst, it was nice to see them let off some steam in a prank war. Sure, it’s immature and more than a little insensitive given the nature of their work, but these are young cops, and they’re going to act like shitheads on many occasions. Ben and some other officers duct tape Sammy’s locker shut with his towel inside, leaving him stranded naked before roll call. Though he and Ben are trying to investigate the shooting death of a few guys in a car on a street in broad daylight, that doesn’t stop Sammy from trying to exact his revenge. First, he gets a waitress at a diner who had a tryst with Ben to act mad at him and pretend she’s pregnant—a rather brilliant way to skewer Sherman for just how much strange tail he chases at all times. Sammy does get some work in during the day, arguing with a bystander about providing evidence, who then wants to file a complaint against Sammy. At the station, the bystander gives up a shred of a lead, then ends up in the hospital after getting shot probably for talking to the police. In the hospital, Sammy convinces Ben to go to the man and try to get information about who shot him—but that’s an even more complicated ruse than the first, the second straight dastardly plan that manages to hoodwink Ben. Even in the dark jobs these cops have to do, they have to find a way to laugh somehow, and not all of them can be as repulsive as Dewey. Ben doesn’t take the two counterpunches lightly, though, since the day ends with Sammy opening his car to find a flock of pigeons flying out and Ben recording everything on his phone. When Tang and Cooper have lunch with Dewey and other officers earlier in the episode, Dewey recounts a rather morbid story of an officer he knew who served 32 years on the force, who retired with little fanfare, then shot himself months later. All that’s left, he says, are the memories other cops have of cases with you. I’d like to see Sammy and Ben’s day in that light, pranking each other back and forth and building up a small kind of legacy with each other. That’s something they’ll be able to reminisce about in a bar, like the “tell your best Cooper story” session Dewey starts in the bar as Cooper lingers in the doorway. Do your job merely as good as you have to in order to get by, and there’s a chance nobody will remember a thing about you. But do it memorably—like Cooper does through some steely resolve instead of a penchant for sprinting after every perp like he’s James Bond in Casino Royale—and even when you leave the bar early, everyone will have a praiseworthy story to share. Still no word on the father of Lydia’s child, though I’m glad that fact isn’t getting crafted into some big mystery that absolutely has to be solved. I didn’t want to spend too much time on Lydia and Rueben this week, because they’re the weak point in this episode yet again. Maybe I’m bored by how easy their cases are to solve, or annoyed with how grumpy Lydia’s character is about revealing any details about her pregnancy. The murder investigation did provide a strong counterpoint to the more inspiring parental message from Lydia’s case last week, and it went by without as much philosophical pondering on what it means to be a parent. Though I think the season premiere is still the best episode so far this winter, the Cooper plot and the Sammy/Ben plot would've made for a stronger episode without the Lydia/Rueben case dragging it down.